SERMON is a small, friendly, and informal gathering of number theorists and combinatorialists. Faculty members, graduate students, and undergraduate students are all invited to attend, and to give talks if they wish. The first SERMON took place at UNC Greensboro in 1988. Since then it has taken place every year at various universities in the southeast. See the home page for the SouthEast Regional Meeting On Numbers for more general information on SERMON and to subscribe to the SERMON e-mail list. In 2019 SERMON was held at the University of North Carolina Greensboro (UNCG) Saturday April 13 and Sunday April 14. Friday April 12 at 4:30 pm in Petty 150. Refreshments at 4:00 pm in Petty 116. You can find directions on the For Visitors page of our department. There is also a list of restaurants. On Saturday parking is free at UNCG because of the Science Everywhere event. McIver Street Parking Deck is closest to the Moore Nursing building (NMOR). It is on the north side of campus and its GPS address is 200 McIver Street. SERMON has a limited budget from which to provide support for travel. In order to stretch our budget, we encourage car pooling and students to share lodging as much as possible. If you have requested travel support fill out the VisitorExpensesSERMON2019 and send it to Matt Boylan by email (boylan@math.sc.edu) or U.S Mail (Matt Boylan, Mathematics Department, University of South Carolina, Columbia, SC 29208). The talks on Saturday and Sunday will take place in room 130 of the Moore Nursing Building (NMOR) which is located right behind the Petty building. Hover over or touch the title of a talk to see the abstract. After Jürgen’s talk we will go to the Old Town Draught House at 1205 Spring Garden St which is a few minutes form the Petty building on foot. You are welcome to join us there (also if you cannot make the talk). 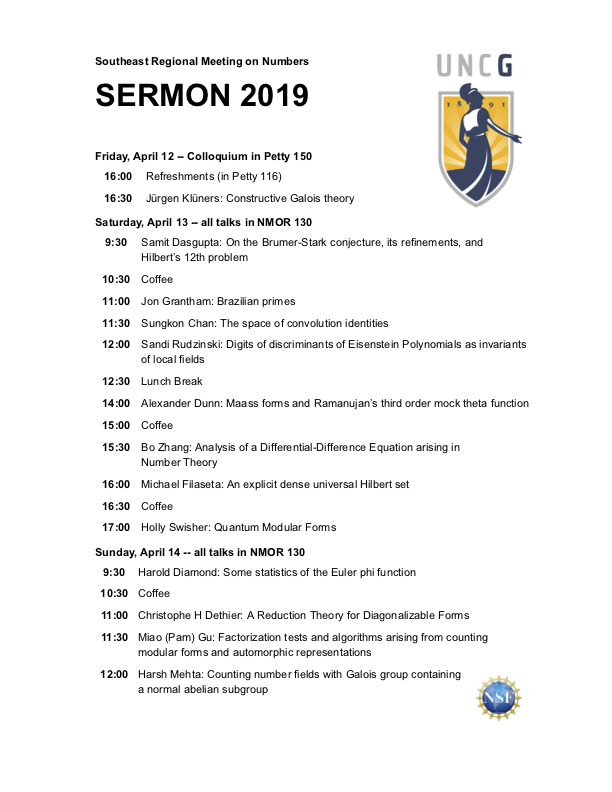 SERMON 2019 is supported by the NSF and UNCG.